Allstar Systems are Gas Safe registered and plumbers in Norwich, Norfolk. We have Plumbers and Heating engineers in Norwich with over 16 years experience, We are your local leading professional plumbing and heating experts who offer a fully comprehensive service for all domestic clients in Norwich, Norfolk. We offer a wide range of exceptional bathroom services, Heating installations, plumbing and heating repairs at the most competitive rates in Norwich and throughout Norfolk.All work carried out is covered by a 1 year guarantee and we provide customers with their needs. Providing a professional, friendly and reliable service, we come highly recommended You need look no further.Plumbing and Heating is our business and we are always updating ourselves with the latest regulations and advancements in technology. We offer a friendly, reliable service at very competitive rates and are covered by 1 million pound public liability insurance. Will and his team replaced a boiler and I can honestly say that there was not a single problem with the work throughout. Will worked an incredibly long day to get the boiler up and running on the first day so we could have heat in the house. His knowledge of the boiler system is incredible and I would definitely recommend him to anyone. I had a new combi boiler installed yesterday. I was really impressed by not only the quality of work, that was easy to arrange, efficient on the day and clearly explained, but also the expertise, enthusiasm and courtesy of the staff. I would definitely recommend them in future. Allstar Systems put in a new hot water system for us, using the existing boilers but installing a new hot water cylinder, new circulation pumps and new controls. They did a great job and I highly recommend them on the basis of our experience. Will made a couple of visits to assess the situation and recommend the solution which he took time to explain. His quote came back quickly and he kept in touch so that I had confidence that the work would be undertaken when planned – which it did. After installation we discovered a problem with some obstructions in the cold water supply (which was totally unrelated to the work on the hot water system that Allstar Systems had installed) … Will and his team came back at very short notice to investigate, identify the problem and resolve it. What was particularly impressive was that Will understood the urgency for us of resolving the issue before the next weekend (when we had new guests renting the property) and went out of his way to deal with the issue, working late and fitting in additional visits around his existing schedule of work with other clients. My overall impression has been that Will is both highly competent (we have a relatively complicated heating set up for a large house) and committed to delivering great customer service. This is the second time I have used AllStar: once to fix a bad repair done by another plumber and subsequently a routine boiler service. On both occasions the service has been excellent and competitively priced. For today's boiler service I was given some very clear and helpful advice regarding possible issues with my heating system. I will definitely be using AssStar again and would thoroughly recommend them. Smooth process from start to finish. Lost all hot water and heating and they responded quickly, coming over to see things and quote within days. Was the most competitive quote received from a bunch with great Warrenty perk. Arranged a time to come at short notice and the work was carried out to a high standard. Everything was explained to me as they went along which was nice. New boiler installed and working within hours. Would definitely recommend. 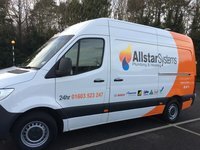 Heating and hot water broke on Sunday afternoon, picked Allstar Systems based on their excellent online reviews and was delighted I did. Called them on the Monday and they were round first thing on Tuesday morning. Great bunch of guys, Will instantly made me feel that whatever the problem was it would be sorted quickly. Although it turned out to be more difficult than anticipated, in a little over 3 hours I was left with heat, hot water and a heating system that works better than it did before. I would definitely recommend this company for friendly reliable and knowledgeable service. All problems professionally repaired within 24 hours, brilliant service, high quality parts fitted at competitive prices! Highly recommended with confidence, many thanks! Finally a plumber I can trust. Will came to my rescue. Within 24 hours of receiving my phone call the fault was diagnosed and within 48 hours, the part was ordered installed and the boiler was working better than ever. Will then took the time to make sure that the boiler was serviced properly and did not leave until all radiators were working to their optimum. All this on a Saturday night, who could ask for more? I will definitely use AllStar Systems in the future. We had Will and his team in to locate and put right a leak in the central heating system. This was finally discovered, as feared, under the solid floor in the kitchen. At this point Will suggested they re-route the pipe work through the wall and under the hallway so as to avoid digging up the floor. This was a huge and potentially very disruptive job but Will and his team were fantastic in all respects working with great professionalism and care to minimise disruption and to the highest of standards. The attention to detail is immaculate. At each point in the job Will made sure that we were told and understood what was happening and the possible implications. The job was carried out to schedule and before they left everything was carefully put back in place. I would recommend Allstar systems with complete confidence, and would certainly employ them again.